MNPS Board Members Will Pinkston and Christiane Buggs wrote a column for the Atlanta Journal Constitution urging voters in Georgia to reject that state’s effort to create an Opportunity School District modeled after Tennessee’s struggling Achievement School District. Under this hostile approach, the ASD rips schools from their communities and hands them over to charter operators that convert them into taxpayer-subsidized private schools. Rather than sticking to a limited scope with a baker’s dozen schools, as originally envisioned, the ASD now has nearly 30 schools in its purview — and it’s expanding every year in ill-advised ways. Tennessee’s ASD came about as a result of legislative approval of the (ultimately winning) Race to the Top application. As Buggs and Pinkston note, in its current form, the ASD has moved beyond the original vision. In doing so, the ASD has encountered problems that include troubling audit findings and a struggle to demonstrate results. Georgia voters get to weigh-in on whether or not their state creates an ASD clone. Buggs and Pinkston offer a cautionary tale of well-intentioned reform gone wrong. “Bullying behavior from anyone is unacceptable anytime and anywhere and it is especially unacceptable from elected officials and leaders in our community. Will Pinkston has brought a notable level of intelligence and hard work to the Metro Nashville Board of Education and it’s clear that he cares tremendously about the quality of the city’s public education. That said, disrespectful language and behavior from elected officials and leaders in our community is always unacceptable. Steve Cavendish at the Scene offers some insight into the Tennessean’s recent dealings with MNPS board member Will Pinkston. Specifically, Cavendish notes that key facts seem to be optional in the paper’s reporting. That Sunday story by Jason Gonzales, which described Pinkston as a bully, interviewed a lot of critics. It quoted a former director of schools that Pinkston stopped from getting a contract extension, an innovation director who routinely fought with Pinkston and other board members and a paid political operative working for (Jackson) Miller. And points out that the Tennessean also endorsed Pinkston, a fact not mentioned in the Gonzalez piece. Of course, on the same day, the Tennessean did allow Pinkston to respond. But, as Cavendish points out, it would have been a lot easier to just include the relevant facts in the first place. Many Tennesseans do not believe that, though. In her legislative race, McCall recently raised $54,000 in one of the most conservative districts in the state. Franklin Mayor Lillian Stewart ($200) and former Nashville Mayor Karl Dean ($500); state Rep. John Ray Clemmons ($250) and state Sens. Lee Harris ($150) and Sara Kyle ($150); Nashville Metro Council members Bob Mendes ($350) and John Cooper, and his wife Laura ($1,500 each, for both the primary and general, for a total of $6,000); attorneys Charles Bone ($1,000), James Yokley ($1,500), Bob Tuke ($250), Leigh Walton ($250), Aubrey Harwell ($250), David Garrison ($250) and Chase Cole ($250). Others backing McCall include Planned Parenthood’s Jeff Teague ($250), and local business leaders Wayne Smith of Community Health Systems ($1,000; CHS also donated $1,000), developer Bert Mathews ($250), former AT&T president Marty Dickens ($1,000), Christopher Hopkins of the developer-friendly Saint Consulting ($1,250) for which McCall has worked, Medalogix CEO Dan Hogan ($700) and Elizabeth Schatzlein, the wife of the former CEO of Saint Thomas Health ($1,500). Looks like they don’t believe she is unfit for public office. Holly McCall, who is currently a Democratic candidate for TN House District 65, has responded to the Tennessean story on Will Pinkston by saying that Will Pinkston allegedly told her that he had a kill list of MNPS employees while pointing at his forehead. Below are other tweets Holly McCall has sent out today about being threatened, scared, and how she feels like she is hurting her chances for office by taking on a candidate backed by the Democratic Party. As you will see below, she doesn’t live in Nashville or support charter schools. Holly McCall has uploaded a screen shot from the latest texts from Pinkston. She also says that Pinkston has been threatening her for six months. Former Director of Schools Jesse Register received complaints from staff about calls, emails, and in person confrontations with Will Pinkston. A handful of current or former employees of MNPS were too scared to go on the record for risk of retribution from Will Pinkston. One staff member said that Will Pinkston would throw you under the bus if he didn’t get his way. After Jason Egly, a MNPS teacher at the time, got into an discussion on twitter, Egly’s principal and district officials approach him to talk about it after Pinkston reported him to the central office. Egly was afraid for his job. Vesia Hawkins, the former board administrator for over six years, requested another assignment because of Will Pinkston. 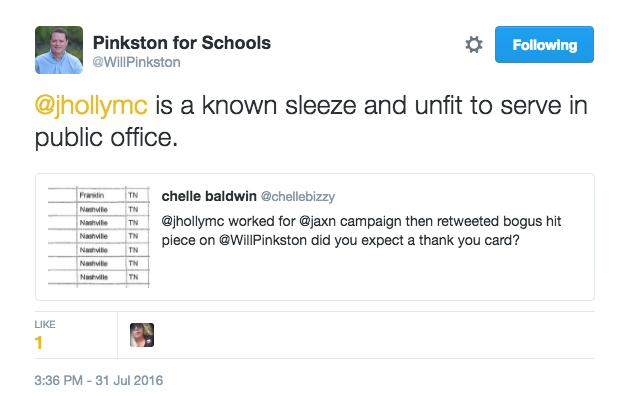 Pinkston continued to contact Hawkins through direct messages on Twitter after she left her board administrator role. Board Chair Sharon Gentry had to tell Pinkston:“Unless you have a business reason to contact her or any MNPS employee, your contact should be with the Director of Schools.” The night after that email from Gentry, Pinkston continued to contact Hawkins. These are just the few brave people who spoke on the record about their experiences with Will Pinkston. I have heard from other teachers and staffers who are too afraid to speak out because they are afraid of losing their jobs. This isn’t bullying, this is abusive. It’s not just bullying when Will Pinkston tells a staff member to barricade himself in an office because he is coming for him. That’s abusive. It’s not just bullying when teachers are afraid of losing their job. That’s abusive. It’s not just bullying when a staff member has to change jobs because of Will Pinkston. That’s abusive. When elected officials in Nashville stand by Will Pinkston, they are enabling this abusive behavior. No one deserves this abuse. 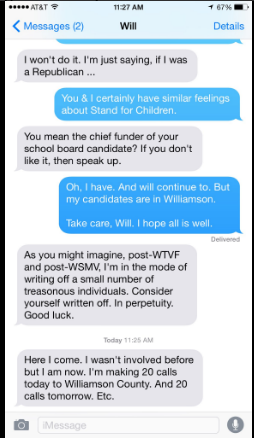 Following emails sent by Marsha Edwards of the Martha O’Bryan Center asking for volunteers and/or paid canvassers for School Board candidates endorsed by Stand for Children, complaints have been filed with the IRS and Tennessee Attorney General by MNPS board member Will Pinkston. In a letter to Attorney General Herb Slatery, Pinkston said Edwards’ emails constitute a violation of the federal law that prohibits direct or indirect political activity by tax-exempt nonprofits. Pinkston told The Tennessean that Edwards should apologize to the school board and resign from her job. Edwards has denied any wrongdoing.